God of thunder he most certainly is, and this time he's out for pure justice. Click here to play! Join the Norse god turned superhero in this epic adventure of a slot machine, and win yourself a thunderstorm worth of cash. Thor is a 5-reel slot played across nine pay lines, with the more lines activated multiplying your payout odds on winning combinations. Thor is the Substitute and can become any other symbol on the reels except for Scatters. Spin up five of him in one go and you will be rewarded with 4000 times your original stake. The Thor logo is Scattered and will trigger the Feature when three or more appear at any one time. The Feature will earn you 10 free games with a special twist, guaranteeing you plenty of lucrative winnings. Join the god of thunder Thor today for your chance at ultimate riches! The Thor logo is scattered and will activate the Feature when three or more appear on one line. Once inside, you will be given 10 free games with a special twist. 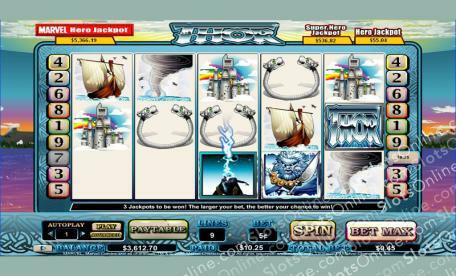 Thor can be substituted for any other symbol on the reels except Scatters, and pays out up to 4000 times your initial wager.